“I work extra hard to make every painting worthy of attention,” says Morgan Weistling. 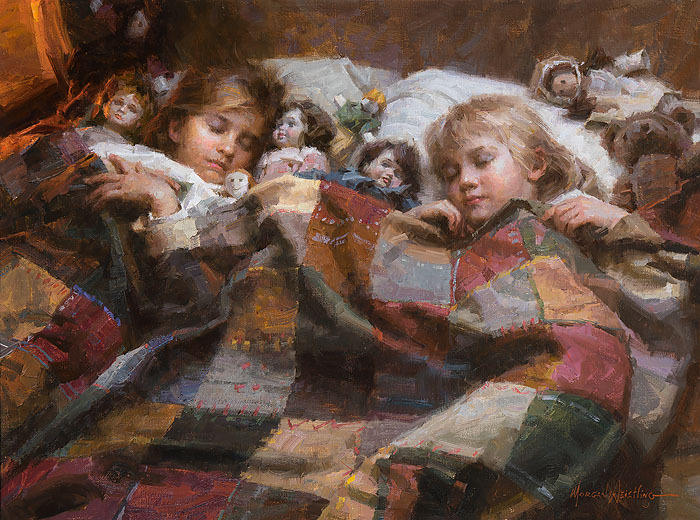 “Every time you put your work out there, you have to present to collectors the very best you have.” Some of his best and most popular art displays the innocence of childhood as a time of wonder and magic and Weistling’s The Sleepover is the perfect example. This painting strikes a chord because it captures such simple and graceful elements of everyday life. You get to peek into the inner world of children and their irrepressible urge to gather things and friends. It was one of the most popular paintings at the Autry’s 2014 Master’s Show. Collectors “Intent to Purchase” slips overflowed from the box placed to collect them. Morgan Weistling’s contemporary impressionism celebrates the wonder of a timeless America and the uncommon beauty of life’s common moments. Youth may be fleeting but as you will discover with your Fine Art Edition Canvas of The Sleepover, it doesn’t have to be out of reach.